Q: The United Nations recently released a report about the security of UN peacekeepers, saying that there had been 56 fatalities of the peacekeepers in 2017, registering the highest number since 1994. This report also put forward proposals to improve the security environment of UN peacekeepers. What is China's comment? As we know, the report is funded by China-UN Peace and Development Fund. Can you confirm that? A: China has always supported UN peacekeeping missions with concrete actions. It has dispatched nearly 40,000 Chinese peacekeeping personnel, among whom 13 Chinese military personnel and 4 policemen have laid down their lives for the mission. China highly values the security of peacekeepers and supports the UN in taking concrete measures to better safeguard the security of peacekeepers, including improving the command system of the entire institution, enhancing emergency command capability, coordinating with the troop contributing countries and host country to enhance the assessment, study, warning and information sharing of local security situation and improve the capability to treat the injured under dangerous circumstances. Recently, the former commander of UN peacekeeping operations was appointed by the UN Secretary-General of to review the issue of peacekeepers' security and submit a report entitled "Improving Security of United Nations Peacekeepers: We need to change the way we are doing business". 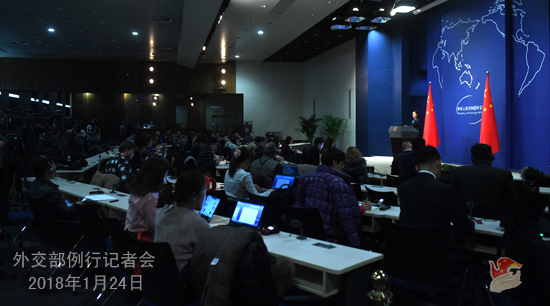 China is seriously looking at the report and will actively participate in relevant discussions. This report is funded by China-UN Peace and Development Fund, which is a major practical measure announced by President Xi Jinping at the summits marking the 70th anniversary of the UN with a view to supporting the UN's work, promoting the cause of multilateralism and making new contributions to world peace and development. By far, the Fund has supported 30 specific projects in such areas as mediation, peacekeeping and counter-terrorism capacity building, the 2030 Agenda for Sustainable Development and refugees and immigrants. Q: According to reports, The World Economic Forum Annual Meeting 2018 opened on January 23. In his keynote speech at the opening ceremony, Indian Prime Minister Narendra Modi said that the forces of protectionism are raising their head against globalization. Reports say that this echoes with what President Xi Jinping said at Davos last year, and it is a veiled criticism of the "America First" policy. What's your comment on Mr. Modi's address? A: The World Economic Forum Annual Meeting 2018 already opened on January 23. Liu He, member of the Political Bureau of the CPC Central Committee and General Office Director of the Central Leading Group for Financial and Economic Affairs has headed a delegation to attend the meeting and addressed the special session themed on China. I believe you still remember the keynote speech entitled "Jointly Shoulder Responsibility of Our Times, Promote Global Growth" delivered by President Xi Jinping at the opening session of the World Economic Forum Annual Meeting a year ago, voicing China's proposal to make economic globalization more open, inclusive, balanced and win-win and advocating an open world economy. It has had a broad and far-reaching international influence. We have noticed that Prime Minister Modi stated his opposition to protectionism at the opening session of the World Economic Forum Annual Meeting this year, which demonstrates that economic globalization is the trend of the times and serves the interests of all countries, especially the developing countries. China is ready to work with all parties to actively adapt to and steer economic globalization so that it will continue to be a positive force in promoting world economic growth and enhancing the well-being of all peoples. 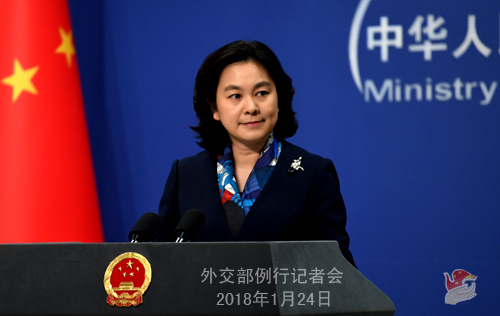 Q: Reports say that the outcomes of the Second Ministerial Meeting of the Forum of China and the Community of Latin American and Caribbean States (CELAC) show that China's foreign policy towards Latin America has continuously been evolving and become more aggressive, posing a challenge to the US predominance in the region. What's your comment on this? A: The allegation that China-CELAC cooperation will challenge the US' leading position in Latin American region is anything but new, which seems to have existed well before the establishment of the China-CELAC Forum. I would like to reiterate that China always develops its relations with other countries in the spirit of the Five Principles of Peaceful Co-existence. Our policy towards Latin America does not target any third party, nor does it aim to challenge or replace anyone's predominance. We sincerely believe that as developing countries, both China and Latin American countries are faced with similar development stage and tasks. The cooperation between the two sides, based on common interests and mutual needs, upholds the principle of equality and mutual benefit, openness and inclusiveness, and win-win cooperation. The development of China-Latin America relations does not target, exclude or affect their relations with other countries. We hope to continue deepening cooperation for common development with Latin American countries. In particular, we hope to achieve the optimization and upgrading, innovation and development, and mutual benefit and win-win results of our cooperation under the framework of the Belt and Road Initiative. Q: Japanese Prime Minister Shinzo Abe announced today that he will be attending the opening ceremony of the Pyeongchang Winter Olympics. Could you please tell us which Chinese leader will attend that event? President Xi Jinping attended the opening ceremony of the Winter Olympics four years ago. A: The upcoming Pyeongchang Winter Olympics will be a grand occasion of the sports circles. The Chinese government actively supports the Republic of Korea in holding the Pyeongchang Winter Olympics and we will let you know who will be attending the event in due course. Q: It is reported that the US government has shifted the focus of its national defense strategy from fighting terrorism to confronting China and Russia. But some in the US said that they don't see any long-term common interests between China and Russia. What is China's comment? A: China and Russia, linked by mountains and rivers and mutually the largest neighbor to each other, are major emerging market countries and permanent members of the Security Council. We share broad common interests in developing good-neighborly and friendly relations for generations, achieving our respective development and rejuvenation and safeguarding regional and global peace and stability. In recent years, bearing the general trend of world peace and development in mind, the two sides have established and developed a new-type of state-to-state relations featuring non-alignment, non-confrontation and non-targeting of any third party, which becomes a model for peaceful coexistence and win-win cooperation between major countries and neighbors. As we can see, under the strategic guidance of the two heads of state in recent years, the comprehensive strategic partnership of coordination between China and Russia has been developing at a high level and achieved a series of new outcomes. The two countries have continuously deepened strategic mutual trust, expanded pragmatic cooperation and maintained close cooperation in international affairs, making important contributions to promoting the peace, stability and steady development of the region and world at large. Facts have proved that the development of China-Russia comprehensive strategic partnership of coordination is not only in the fundamental interests of the two countries and peoples, but also an active strategic force for maintaining and promoting world peace and development with enduring vitality. We stand ready to make joint efforts with Russia to ensure that China-Russia relations always maintain healthy and steady development at a high level and contribute more positive energy to promoting world peace, security, and prosperity. Q: We have noted that with protectionist voices on the rise in the US, many countries and people express their concern over a potential trade war. What's your opinion? A: Trade protectionism is a double-edged sword that can get oneself wounded while hurting others. I wonder whether the legendary impenetrable "super armor" really exists, one that can guarantee the invulnerability of a certain country when it wantonly wields the big stick of trade protectionism at others? As far as China is concerned, I would like to draw your attention to the address delivered by Foreign Minister Wang Yi yesterday at the opening ceremony of the China-LAC Economic Cooperation Forum and the China-LAC Entrepreneurs Council's 2018 Annual Meeting in Santiago. In that address, he talked about the new look China has taken on after the socialism with Chinese characteristics entered a new era, elaborating on important evolution of China's development concepts, major transformations in China's economic system and all-round deepening of China's opening-up. Foreign Minister Wang Yi pointed out in particular that China's economic structure has been constantly optimized and upgraded. In 2017, the contribution of domestic consumption to the Chinese economy has exceeded 65%. The total domestic consumption in China is expected to overtake the US for the first time in 2018. This means that after 2018, the world's largest market will be China. China's potential market size is three to four times that of the US, and the potential is now being turned into reality with a foreseeable future. That is the power of market. The market cannot be robbed by force; it can only be won through sweat and toil. China will, as always, handle the new situation that rises as a result of the laws of the market from a positive perspective and promote greater development of economic and trade relations with other countries to achieve win-win cooperation by making the pie bigger. Q: Yesterday, the Russian Ambassador to the UN proposed to set up a new international investigative body on the use of chemical weapons in Syria. The US side criticized this move by Russia as a distraction from the issue of the use of chemical weapons in Syria. What is your comment? A: China's position on the use of chemical weapons is consistent and clear. We oppose the use of chemical weapons by any state, organization or individual, for any purpose, or under any circumstances. 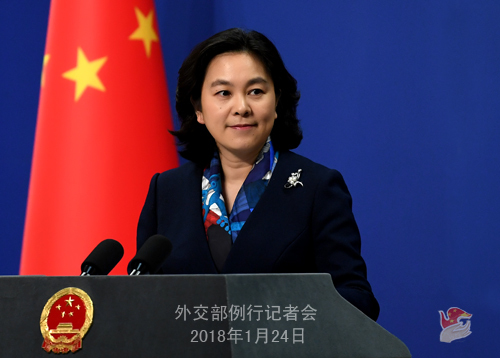 China supports a thorough, impartial and objective investigation on chemical weapons attacks, and the investigation should be based on solid and reliable evidence and conclusions must be able to stand the test of time. A united Security Council is an important guarantee for achieving the political settlement of the Syrian issue. We hope that all parties of the Security Council could enhance coordination, send a clear and concordant signal on specific issues concerning Syria, including the use of chemical weapons, the humanitarian needs and the political process, and lend strong political support to the comprehensive settlement of the Syrian issue. Q: Considering your positive comments on Prime Minister Modi's speech at Davos, can there be any kind of coordination between the two sides to oppose protectionism in general? Can it be used to enhance bilateral relations between the two countries? A: As I said, we noted that Prime Minister Modi has spoken out against protectionism at the opening session of the World Economic Forum Annual Meeting. It actually reflects the fact that economic globalization is the trend of the times which serves the interests of all countries, especially the developing countries. On the fronts of opposing trade protectionism and advancing economic globalization, China and India share common grounds and common interests. It goes without saying that we would like to enhance communication and coordination with India and other countries in actively adapting to and steering economic globalization so that it becomes a positive force for the economic growth and the welfare of all countries. Regarding China-India relations, our position is very clear. India is an important neighbor of China. We are the two largest developing countries and each other's neighbor. We indeed hope to maintain a sound and steady development of bilateral ties, as it serves the common interests of the two sides. We hope to work with the Indian side to enhance communication, mutual understanding and trust and properly handle differences so as to ensure the sound and steady development of bilateral relations. I believe that is also what the people in the two countries expect from us.